Draft Amendment 7 to the 2006 Consolidated HMS Fishery Management Plan (FMP) for bluefin tuna was released in August of 2013 with possible alternatives for managing domestic bluefin tuna. 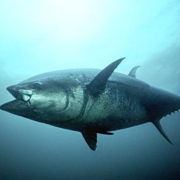 The National Marine Fisheries Service (NMFS) must find a balance between management decisions that will prevent overfishing and minimize bluefin bycatch while also providing opportunities for U.S. fishermen to harvest the full allocation of bluefin tuna. Landing and retaining the entire U.S. quota is a major concern; a failure to land and retain the quota could result in a loss of tonnage to other nations and a diminishment of U.S. negotiating strength at international negotiations. If the U.S. loses part of its quota, it may no longer be viewed or treated as a major fishing nation with less deference and respect given to its conservation and management preferences at international negotiations. The objectives of Amendment 7 are to take actions that will rebuild the stock, end overfishing, and meet conservation and management objectives set forth in the 2006 HMS Fishery Management Plan as well as international recommendations established by ICCAT. In doing so, the new fishery management plan will optimize fishing opportunity, enhance reporting and account for and reduce bluefin tuna dead discards. Dead discards are an important aspect because they are now accounted for as part of the allocated quota and a reduction in dead discards is beneficial for the fishery. The Draft Amendment 7 focuses primarily on quota re-allocation of bluefin tuna amongst categories, but also proposes alternatives to open current pelagic longline closed areas to longline fishing again as well as establishing new longline closures to minimize bluefin tuna interaction and discards. TBF has broken down the main proposed alternatives in Amendment 7 and provided initial comments for each below. Since the implementation of the longline closures in 2000, the number of blue marlin, white marlin, and sailfish discards have decreased significantly. Between 2001-2003, the years immediately following the longline closures, discards reduced by 49.7% for blue marlin, 47.0% for white marlin, and 74.6% for sailfish. More recently in the years between 2005-2011 the number of discards for blue marlin, white marlin, and sailfish reduced by 61.6%, 59.8% and 66.9%, respectively, compared to the years before the longline closures. Additionally, the number of swordfish discards, primarily due to catching juvenile fish, reduced by 56.7% between 2005-2011 compared to before the pelagic longline closures. It is no coincidence that the swordfish stocks are now fully rebuilt where there were below Maximum Sustainable Yield (MSY) before the longline closures were implemented. NMFS estimates that 80 trips will be taken annually into the DeSoto Canyons closed areas by longline boats in the Gulf of Mexico. Similarly, it estimates that 20 trips annually will be taken into the Florida East Coast (FEC). Vessels fishing in these areas would be required to have an observer on board and report their catches daily. Despite NMFS having the ability to close these areas based on bycatch and discard numbers, the potential negative impacts simply do not outweigh the conservation benefits seen by the establishment of these closed zones. 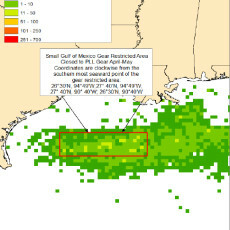 In Alternative E 3, NMFS is considering allocating a portion of the Trophy South Sub-Quota to the Gulf of Mexico. Currently the sub-quota for trophy-sized bluefin tuna (greater than 73″ curved fork length) is split between the north and the south, each receiving 1.4 metric tons (mt) and 2.8 mt, respectively. The North/South dividing line for the Trophy Sub-Quota is Great Egg Inlet, NJ and does not currently provide equal opportunity to all anglers along the South Atlantic and in the Gulf of Mexico. In both 2011 and 2012, the trophy Southern allocation for Trophy bluefin tuna was closed the first week of April, limiting the opportunity for many anglers. While it is illegal for anglers to target bluefin tuna in the Gulf of Mexico, providing them with quota will reduce dead discards of bluefin tuna caught unintentionally while fishing for other target species. Within Alternative B 1 for Area Based Alternatives, NMFS is considering several possibilities for additional restricted areas for longlines with the goal of reducing interactions and discards of bluefin tuna. 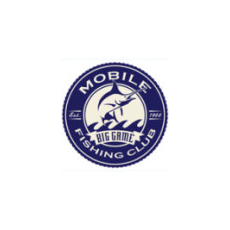 One of the two preferred alternatives is the establishment of a ‘Small Gulf of Mexico Restricted Area’ that would restrict the use of pelagic longlines for the months of April and May (Alternative B 1f). The identified area encompasses the areas of historically high bluefin tuna interactions and would still permit the use of alternative gears (green stick and buoy gear) within the closed zone to fish for yellowfin tuna and swordfish. 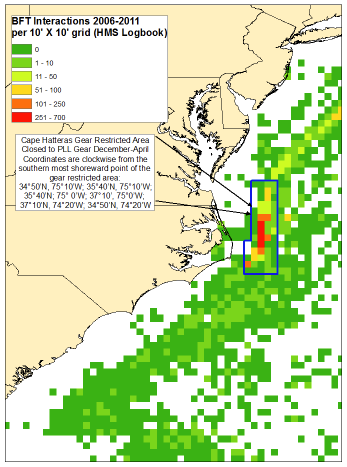 The proposed “Access Based on Performance” for a new Cape Hatteras Pelagic Longline Restricted Area is also a preferred alternative that would reduce the interactions with and discards of bluefin tuna. Vessels determined to have a demonstrated low rates of interactions with bluefin tuna and compliance with vessel reporting and monitoring requirements would be permitted to fish the months of December through April in the gear restricted area. The combined impacts of the two preferred alternatives (The Cape Hatteras Gear Restricted Area with Performance Based Access and The Small Gulf of Mexico Gear Restricted Area) would reduce the number of bluefin kept by 3% and the number of bluefin discarded by 33% fishery-wide. Alternative B 1e is more restrictive and would prohibit longline fishing in the Gulf of Mexico within the U.S. Exclusive Economic Zone (EEZ) for three months (March through May) west of 82°W. Longline vessels would be authorized to still fish, but required to use buoy gear, greenstick gear, or rod and reel. Subsequently, rules and regulations for those particular gear types must be followed. No doubt Alternative B 1g, which would restrict pelagic longline gear in the Gulf of Mexico year-round, would generate the maximum reduction in bluefin tuna discards, but it would have significant negative impact on the productivity of the domestic yellowfin fishery. TBF Recommendation: TBF believes for a pelagic longline closure to be effective in the Gulf of Mexico, it must encompass the entire EEZ west of 82°W. 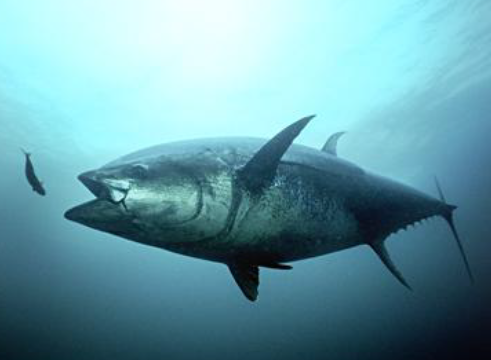 The preferred alternative, the ‘Small Gulf of Mexico Closed Area’, does not generate enough benefits for bluefin tuna. Fishery-wide, this alternative is only estimated to have a 2.6% reduction in the number of bluefin tuna kept and a 3.4% reduction in the number of bluefin tuna discarded. 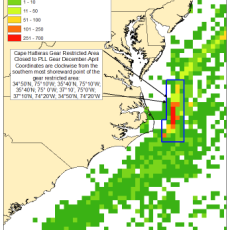 The significant benefits for bluefin tuna primarily are from The Cape Hatteras Closed Area with Performance Based Access. Fishery-wide, this area is estimated to reduce the number of bluefin kept by 3% and the number of bluefin discarded by 29%. 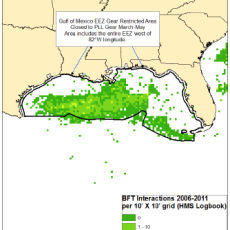 Of the proposed alternatives, TBF supports the 3-month Gulf of Mexico Closure (March-May) for several reasons. The fishery-wide change for bluefin tuna would be a reduction of 12% for bluefin kept and a reduction of 10% for bluefin discarded. Combined with the Cape Hatteras Closure, this would provide a combined reduction of 15% for bluefin tuna kept and a reduction of 39% for bluefin discarded, better achieving the goal of reducing bluefin discards. 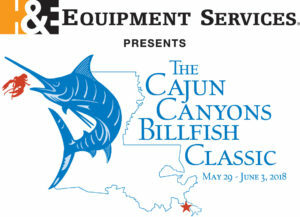 Additionally, the benefits for billfish will also be greater with a 3-month Gulf of Mexico closure. 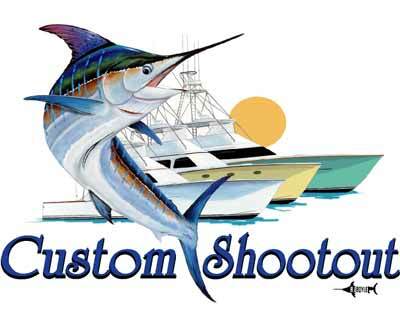 This closure is estimated to reduce bycatch of blue marlin, white marlin, and sailfish by 8%, 4%, and 10% respectively, compared to less than 1% for each species for the ‘Small Gulf of Mexico’ closure. 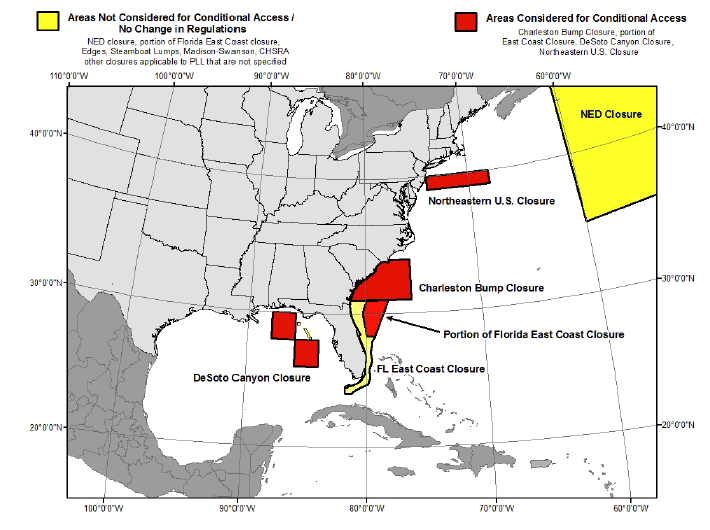 A 3-month Gulf of Mexico closure would produce an additional 12% reduction in swordfish discards for the entire fishery. During these months, the use of buoy gear and other alternative gears would still be permitted to fish for swordfish in the Gulf of Mexico. 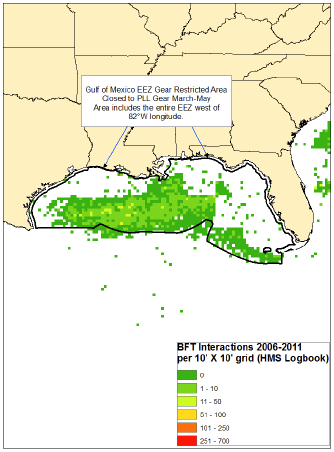 TBF would further support the establishment of a 4-month Gulf of Mexico longline closure (March-June). 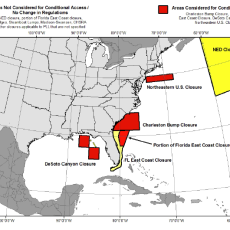 This closure would allow for more management flexibility and any changes in seasonal migrations of bluefin tuna in the Gulf of Mexico that may occur. Using the 2006-2011 logbook data, the additional month of June would reduce the bluefin tuna kept in the Gulf of Mexico by 13% (16% fishery-wide) and reduce discards by 12% (40% fishery-wide). The benefits for billfish from a 4-month Gulf-wide closure would nearly double compared to the 3-month closure with discards of blue marlin, white marlin, and sailfish reducing by 15%, 10% and 18% fishery-wide. 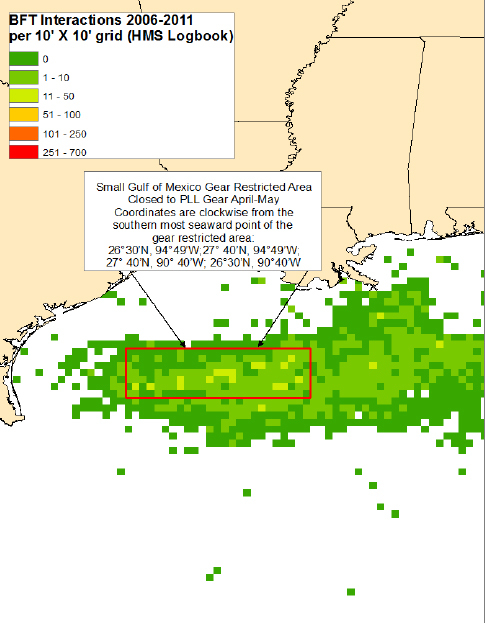 The additional month would only have marginal impacts on target species compared to the 3-month Gulf of Mexico closure. 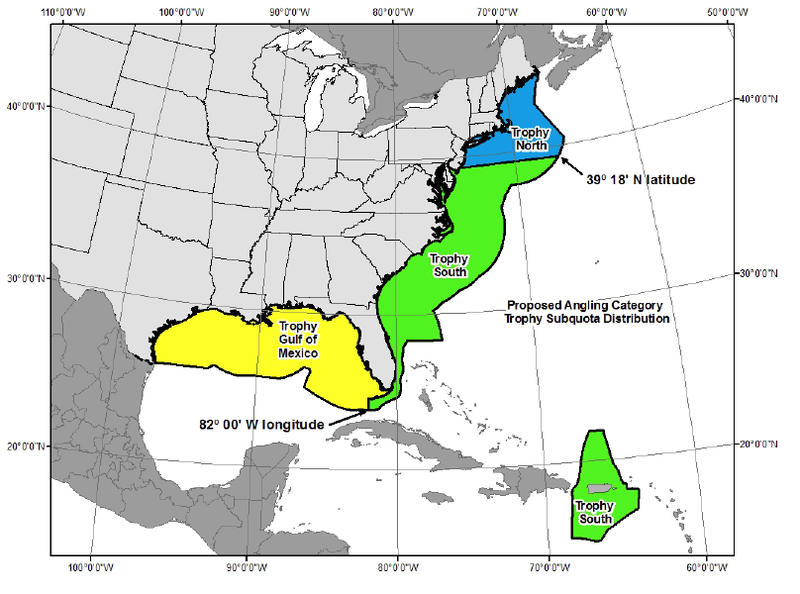 While TBF understands that a 6-month or 12-month longline closure in the Gulf of Mexico would be the most beneficial for bluefin tuna, billfish, swordfish, and other marine life, NMFS must balance conservation goals with realities of domestic fisheries management and the need to harvest target species for the country to stay prominent in international fisheries negotiations. Closing the Gulf of Mexico year-round will provide a reduction of 21% in kept bluefin tuna and 12% in bluefin tuna discards. If a year-long closure is implemented, the yellowfin fishery would experience a 40% reduction in landings and swordfish landings would reduce by 15%. A year-long closure would provide minimal additional benefits to reducing bluefin tuna discards compared to a 4-month closure, one of the primary objectives of Amendment 7. To limit the amount of dead discards and provide incentives for pelagic longline vessels to avoid bluefin tuna, NMFS proposes the use of ‘Individual Bluefin Tuna Quota’ (IBQ) in Alternative C 2. The objectives of the IBQ system are to limit the amount of bluefin landings and discards in the pelagic longline fishery, provide incentives for vessels to avoid bluefin tuna, and to balance the objective of reducing bluefin discards with optimizing other fishing opportunities. The proposed alternatives within the complex proposed IBQ system have several possibilities that address the vessels eligible to receive bluefin quota shares, the means by which quotas will be allocated, vessel requirements for an IBQ, the details associated with IBQ trading, and how the program will be evaluated in the future.